Making filled pasta is like giving someone you love the perfect present. 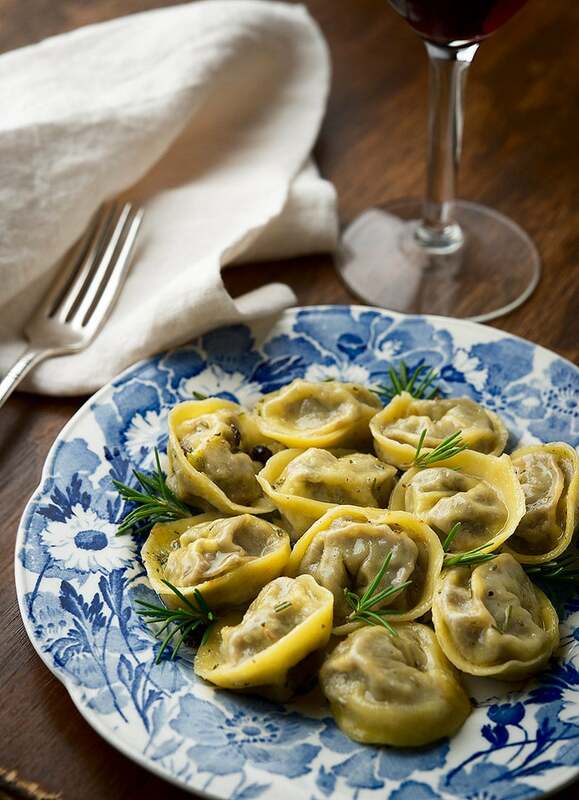 Everything about a great filled pasta — whether it is a tortellini, or its larger brother tortelli, a ravioli, pansotti, mezzaluna or whatever — requires the kind of care given to a perfectly chosen and presented gift. What sort of pasta will you make? What shape? How delicate? How large? What will fill it? Will it be coarse or smooth? Meat or cheese or veggies? And how will you serve it? In broth? Steamed? Fried? Boiled? Does it have a sauce? If so, how bold or simple or complex? All are decisions you the cook must make, and it is the combination of those decisions that gives filled pasta the potential to make those you cook for swoon. Regular pasta just isn’t the same. Everyone loves opening presents, and taking a bite from a lovingly made tortelli, filled with All That Is Good In Life, wrapped in a perfect pasta and bathed in a demure but harmonious sauce is as close as a cook can do to giving you that longed-for gift you never received. Filled pasta is an excellent use for any wild game, incidentally. Game meats are, in general, heavy on flavor, but tend toward toughness. Grinding them with plenty of fat and herbs and other good things won’t destroy that flavor, and it solves the toughness question. In this case I used a few wild pigeons we’d shot especially for this dish. I first learned about pigeon tortellini from Chef Paul Bertolli’s excellent book Cooking by Hand; my recipe is adapted from his. Fat is critical; too little will make the mix crumbly and dry. How fine a grind? The smaller the shape, the finer it must be. A big raviolo or mezzaluna — something two or three to a serving — could be a lot coarser in texture. Remember that it is the filling that counts, not the sauce. Make the filling so good you want to keep eating it and eating it while you are making them, and you have succeeded in making a good ravioli, or mezzaluna or whatever. Sauces for filled pasta by necessity need to be simple, so as to not compete with all that work you did making the filling. Basic tomato sauces, cheese sauces, good broth, or simply sage-and-butter sauce. This is what you want. What sort of pasta? Sometimes I like adding “rougher” flours to wild game pastas because they are more rustic and marry better with game. I’ve used spelt, farro (another ancient wheat), barley, rye, chestnut and even acorn flour for this. Semolina is a good middle ground. Eggs in the dough or no? Your choice. I’ve done both with good results. Eggy pastas don’t store as long but are richer in flavor. They speak “refined” to me more, and I use them a lot with veggie fillings. I cooked these morsels, stuffed with ground pigeon, sweet wine, herbs and roasted garlic, and dressed them simply with butter infused with juniper and rosemary, then topped it all with grated cheese. The dish has a very Old World flavor, deep and warming. Pigeon, if you’ve never had it, is closer to beef or duck than it is to chicken, and you really taste the sherry and herbs in the filling, and the rosemary and juniper definitely come through in the butter. Damn good, if I do say so myself. They are a labor of love and do take some time to make, but they’re worth every moment. 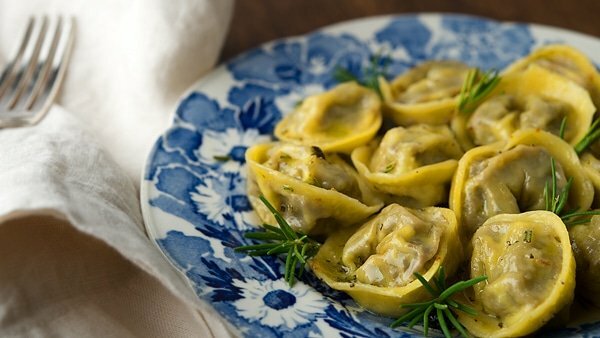 Note that you will need to cook these tortellini within a couple hours after making them -- or you can freeze them and have them ready to rock whenever, although frozen tortellini only keep for 3 to 4 months before deteriorating. To properly freeze, put the whole baking sheet in the freezer for a few hours, then you can put them all in a freezer bag. Once they're made, this recipe comes together in minutes. This is also a recipe you can use for any red meat: Pigeon, squab and dove of course, but duck, goose, sharptail grouse, ptarmigan, woodcock, are all good substitutes. Or you could use venison, lamb, goat or beef, too. To make the dough, make a well in the flour and drop the eggs and water in. scramble the eggs in the center with a fork and then incorporate the flour until you get a shaggy mass. Knead this well for 6 to 8 minutes, then wrap the dough in plastic wrap and set aside for an hour. Alternatively, if you have a vacuum sealer, you can seal the dough, which will hydrate the dough instantly. To make the filling, salt the pigeons well while you heat up the duck fat in an ovenproof pan. Pat the birds dry and brown them well on all sides. Take your time to do this: You want them well browned. When you start this process, preheat the oven to 350°F. Once the pigeons are browned, add the garlic cloves to the pan and pop it into the oven and roast for 30 minutes. When the pigeons have cooked, remove the pigeons and garlic to a plate to cool. Set the pan on the stove (remember the handle is hot!!) and deglaze all that browned goodness with the sweet wine. Use a wooden spoon to scrape down the pan to incorporate everything. Let this boil for a few minutes, then turn off the heat. Pick off all the meat from the pigeons (use what's left for stock if you want.) and remove the skins from the garlic. Chop the meat and garlic roughly and add it to a food processor. Add the celery seed, rosemary and black pepper, as well as some of the liquid and fat from the roasting pan and buzz everything into a fairly smooth paste. Taste and add salt if you need to. You might need all of the pan liquid, you might not. Eyeball it. Roll out the dough in a pasta maker or with a rolling pin. I roll mine out to No. 7 on my Atlas, with is two stops from the thinnest setting. You don't want it ultra thin or the filling will soak through. Use something round to cut out circles of about 3 inches across -- these are largish tortelli, not strictly tortellini. Put a heaping teaspoon of filling in the center of the circle and fold it into a half-moon, removing as much air as possible. You might need to wet the edges with a little water. Bring the ends of the half moon together and squish them to make the tortelli. You might need to flip the edges up to get that shape. This recipe makes about 40 to 45 tortelli, or twice that many tortellini if you make them small. Set each one on a baking sheet that you've dusted with semolina flour or fine cornmeal. To finish, melt the butter in a wide pan and add the juniper and rosemary. Keep this over low heat while you boil some water; this allows the flavors to infuse in the butter. Boil the tortellini until they float, and then for 1 minute more. Move to the butter, toss to coat and put them on the plate. Grate some cheese over them and serve at once. I like a mid-range red wine to drink with this, like a Chianti or a French Cotes du Rhone. As for beer, go with something bold and malty like a Scottish ale or an English brown ale or a German dunkelweizen. Teal from this year’s teal season…you have a bright (butter coated) future ahead of you. Little gift packages is right. Maybe that’s why I love tortellini so much. My Daisy could eat them every day without tiring of them. wonton wrappers. But, your recipe looks so good – I have to give it a try. Whoa. I run a pigeon control company in Arizona — http://www.phoenixpigeons.com — maybe I’ll have to start making me some Pigeon Pasta!